inflammation of a nerve; also used to denote certain noninflammatory lesions of the peripheral nervous system. There are many forms with different effects; some increase or decrease sensitivity of the body part served by the nerve, others produce paralysis, and some cause pain and inflammation. The cases in which pain is the chief symptom are generally called neuralgia. See also neuropathy. adj., adj neurit´ic. Neuritis and neuralgia attack the peripheral nerves, the nerves that link the brain and spinal cord with the muscles, skin, organs, and all other parts of the body. These nerves usually carry both sensory and motor fibers; hence both pain and some paralysis may result. Treatment varies with the specific form of neuritis involved. Generalized Neuritis. Certain toxic substances such as lead, arsenic, and mercury may produce a generalized poisoning of the peripheral nerves, with tenderness, pain, and paralysis of the limbs. Other causes of generalized neuritis include alcoholism, vitamin-deficiency diseases such as beriberi, and diabetes mellitus, thallium poisoning, some types of allergy, and some viral and bacterial infections, such as diphtheria, syphilis, and mumps. Some attacks begin with fever and other symptoms of an acute illness. However, neuritis caused by lead or alcohol poisoning comes on very slowly over the course of weeks or months. Usually an attack of generalized neuritis will subside by itself when the toxic substance is eliminated. Rest and a nutritious diet containing extra vitamins, especially of the B group, are helpful. Physical therapy may relieve the pain and paralysis. Generalized neuritis may be prevented through knowledge of the dangers of poor nutrition, industrial hazards, chronic alcoholism, and infections. Special Types of Neuritis. Frequently, instead of a generalized irritation of the nerves, only one nerve is affected. bell's palsy, or facial paralysis, results when the facial nerve is affected. It usually lasts only a few days or weeks. Sometimes, however, the cause is a tumor pressing on the nerve, or injury to the nerve by a blow, cut, or bullet. In that event, recovery depends on the success in treating the tumor or injury. Neuritis of the Spinal Nerves. Injury or disease may affect any of the many nerves traveling out from the spine. For example, inflammation of the nerves between the ribs causes pain in the chest that may resemble pleurisy or even coronary occlusion (heart attack). This is called intercostal neuritis or intercostal neuralgia. Similarly, the nerves traveling down the neck to the arm may be subject to various injuries or diseases. For example, too vigorous pulling on the nerves in the neck of a fetus, as in difficult obstetrical deliveries, causes the condition known as brachial paralysis. Neuritis of the Cranial Nerves. Bell's palsy results from inflammation of the seventh cranial, or facial nerve. The fifth cranial, or trigeminal, nerve, also ends in the face and jaws, and may be the source of a neuralgia that causes spasms of pain on one side of the face, called tic douloureux or trigeminal neuralgia. It may be set off by a draft of cold air, by chewing, or by other factors. Medicines and, if necessary, surgery can relieve this painful malady. Optic neuritis refers to any of various conditions in the nerves leading to the retina of the eye; this is potentially dangerous to vision and requires immediate treatment. Any of the other cranial nerves may be affected by infections, tumors, and toxins. The antibiotic streptomycin occasionally causes damage to the eighth cranial nerve, which helps control the sense of balance in the inner ear. Any disturbance of vision, hearing, balance, swallowing, taste, or speech may be a sign of trouble in the cranial nerves, and should be immediately brought to the attention of a health care provider. interstitial neuritis inflammation of the connective tissue of a nerve trunk. optic neuritis inflammation of the optic nerve; it may affect the part of the nerve within the eyeball (neuropapillitis) or behind the eyeball (retrobulbar neuritis). parenchymatous neuritis neuritis affecting primarily the axons and the myelin of the peripheral nerves. retrobulbar neuritis optic neuritis affecting the part of the optic nerve behind the eyeball. toxic neuritis neuritis due to a poison. traumatic neuritis neuritis following and due to injury. 1. Inflammation of a nerve. hereditary optic neuritis Leber's hereditary optic neuropathy. optic neuritis inflammation of the optic nerve, affecting part of the nerve within the eyeball (papillitis) or the part behind the eyeball (retrobulbar n.) . retrobulbar neuritis see optic n.
toxic neuritis see under neuropathy. Inflammation of a nerve or group of nerves, characterized by pain, loss of reflexes, and atrophy of the affected muscles. an abnormal condition characterized by inflammation of a nerve. Some of the signs of this condition are neuralgia, hypesthesia, anesthesia, paralysis, muscular atrophy, and defective reflexes. Inflammation of a nerve–neuropathy is also widely used. See Optic neuritis, Retrobulbar neuritis. Inflammation of a nerve. This may be due to virus infection, loss of blood supply, mechanical injury, autoimmune disorder, vitamin deficiency, poisoning, or other poorly understood causes, such as the DEMYELINATION occurring in MULTIPLE SCLEROSIS. Some of these conditions involve pathological processes other than inflammation and should more properly be described as neuropathy rather than neuritis. An inflammation of the nerves. n a condition distinguished by nerve inflammation; characterized by hypesthesia, neuralgia, paralysis, anesthesia, deflective reflexes, and muscular atrophy. n the inflammation of a nerve, accompanied by pain and tenderness over the nerves, anesthesia, disturbance of sensation, paralysis, wasting, and disappearance of reflexes. pl. neuritides; inflammation of a nerve; also used to denote noninflammatory lesions of the peripheral nervous system. See also neuropathy. There are many different forms of neuritis. Some increase or decrease the sensitivity of the body part served by the nerve; others produce paralysis; others cause pain and inflammation. The cases in which pain is the chief symptom are generally called neuralgia. Neuritis and neuralgia affect the peripheral nerves, the nerves that link the brain and spinal cord with the muscles, skin, organs, and all other parts of the body. These nerves usually carry both sensory and motor fibers; hence both pain and some paralysis may result. see experimental allergic neuritis (below). a cause of sudden blindness in old horses of unknown etiology but sometimes associated with trauma to the head. There are signs of acute inflammation with optic neuritis and later atrophy. an incidental unilateral finding in old horses of cauliflower-like mass attached to the optic disk; vision is not impaired. an ascending polyneuritis produced experimentally by the administration of nerve tissue. The condition resembles guillain-barré syndrome, cauda equina neuritis in horses, and coonhound paralysis. Called also allergic, autoimmune neuritis. inflammation of the connective tissue of a nerve trunk. neuritis affecting several nerves at once; polyneuritis. inflammation of the optic nerve, affecting the part of the nerve within the eyeball (neuropapillitis) or the part behind the eyeball (retrobulbar neuritis). 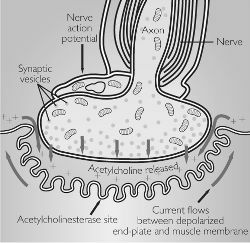 neuritis affecting primarily the axons and the myelin of the peripheral nerves. optic neuritis affecting the part of the optic nerve behind the eyeball. neuritis due to some poison. neuritis following and due to injury.